technews Apple iPhone XS and iPhone XS Max - Everything You Need To Know. Having announced the two new flag high-end phones, iPhone XS (pronounced "ten S") and the iPhone XS Max. What’s the difference between the iPhone XS and iPhone XS Max? 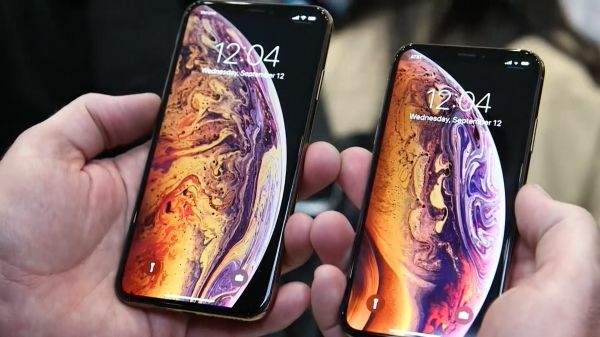 iPhone XS has a 5.8-inch OLED display while the iPhone XS Max has a 6.5-inch OLED display, meaning the iPhone Xs Max is larger; however, other than that, there is no difference between the two new phones on the inside. Although, one notable difference is the battery. The iPhone XS and iPhone XS Max are both going to outperform last year’s iPhone X when it comes to battery life, but the iPhone XS Max does have a bigger battery than the smaller iPhone XS. Apple states that the iPhone XS will last up to 30 mins longer than the iPhone X, while the bigger iPhone XS Max is quoted as lasting 1.5 hours longer than the iPhone X from last year. The iPhone Xs and iPhone XS Max makes use of the new A12 Bionic chip. Both phones have a 6-core CPU and a 4-core GPU, both of which are faster and more powerful than iPhone X from last year. The iPhone XS and iPhone XS Max both comes with a dual camera system on the back that consists of an f1.8 12MP wide-angle lens and an f2.4 12MP telephoto lens. The cameras have new and upgraded sensors over the iPhone X last year and Apple claims it will produce pictures with greater detail and more sharpness. The same front-facing selfie camera that was on the iPhone X is retained on the iPhone XS and iPhone XS Max. The selfie cam is a 7MP camera with an f2.2 aperture that can record 1080p video and Portrait Mode photos as well. The new A12 Bionic chip has a new feature Apple calls "SmartHDR" , which is able to produce HDR photos in faster and with much better detail and exposure. Plus, the Portrait Mode can not only let you apply lightning filters, but the iPhone XS and iPhone XS Max will let you adjust the depth of the photo with a slider in the edit screen. This will allow you to take a photo and adjust the level of blur in the background. Apple says that with the new A12 Bionic chip combined with the new sensors in the cameras on the back will provide better low-light video and performance. Apple showed off a few new apps that took advantage of the new specs of the iPhone XS and iPhone XS Max. The most amazing one was a basketball training AR app called Homecourt. The app can watch you take shots around a basketball net and give you real-time feedback of shot percentage and other important stats — super neat! The iPhone XS and iPhone XS Max will both have Qi wireless charging and Apple says it will charge slightly faster than the iPhone X. Both the iPhone XS and iPhone XS Max comes with an IP68 ingress protection rating, meaning it’s even more water-resistance than last year’s iPhone X. The IP68 theoretically means the iPhone XS and iPhone XS Max is “protected from long-term immersion up to a specified pressure by the manufacturer.” Apple hasn’t announced that pressure as of yet. Both the iPhone XS and iPhone XS Max are available for order at the time of writing this post and will shipped on September 21. What colors will it come in? Both the iPhone XS and iPhone XS Max will come in space gray, silver, and gold. Will the iPhone XS & iPhone XS Max come with iOS 12? Yes! Both models will ship with Apple’s newest operating system iOS 12 right out of the box!